This past week has been one of synergies! Starting with lunch with a local architect whose work I really like and ending with a presentation today at her firm on work I did last summer designing the Center for Virtual Collaboration in Second Life. Or rather, “ending” isn’t the right word because I think we’ve set in motion some really interesting possibilities for further exploration of using virtual worlds for architectural visualization. First, you may have come across my work for some professors in the Business, Education and Psychology depts at the University of Oregon last summer. I blogged about the early stages in this post. I’m afraid that I didn’t really follow up on the completion of that project as I ran up right against the wall of my Australian travels. Here is what the final project site has come out looking like… the Center is the complex of white buildings and the white tower surrounding the lake in the foreground. Walking home from the lunch on Tuesday when I committed to giving the talk on Friday I began thinking about what had worked or not in the Collaboratory project as an architectural experiment. I decided to revisit that project by inquiring into another virtual world system I had heard mention of: a Sun Microsystem’s developed open source environment called Open Wonderland. Surely if we had access to the internals of the environment I could tailor it to better meet our needs? Turns out that the owners of that project were also highly interested in the use of virtual environments for architectural visualization. A flurry of emails and possibilities ensued. The ability to interactively walk through and tour a site is so much more powerful in understanding a space than are still images or animated fly-throughs. 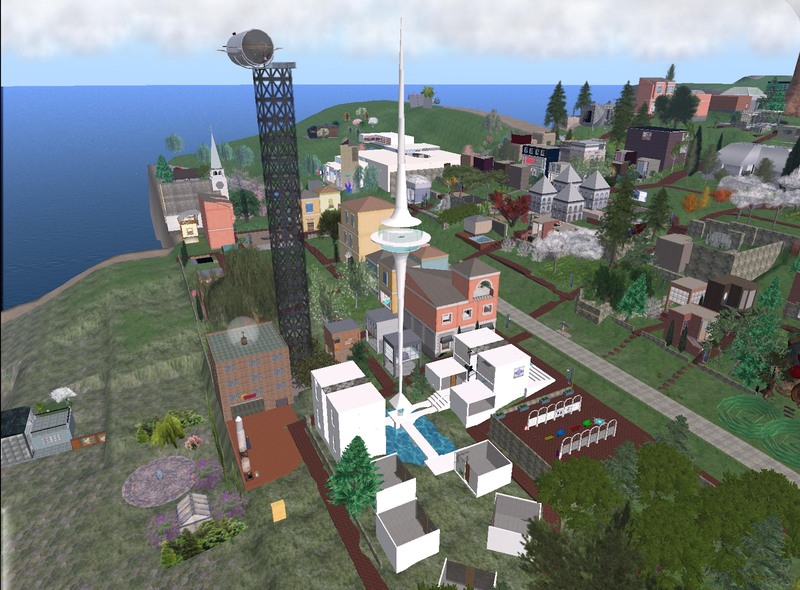 But the Second Life world is a social “game space” rather than a professional environment. The limitations imposed on object creation to make it renderable and game-like get into the way of creating a realistic environment for study and visualization. Moreover the difficulty of translating modern architectural models, even Sketchup, into the Second Life world has made it difficult if not unusable. What we want is a virtual environment in which it is possible to quickly import and instantiate a building and its site and then enable architect/client meetings and walk throughs of the designed spaces. As one of the architects today pointed out during my talk, it could also greatly enhance the teaching of architectural design given that 99% of student projects are never built and therefore never experienced at that level. There are a lot of things missing of course… sound, smell, touch, feel… directed sunlight and shadows. Perhaps it would reduce our tendency to build architecture too heavily based upon visual character as presented in photo-realistic renderings. It could enhance and enable much more effective discussions about spaces. Or perhaps it will make it all worse, a different kind of pseudo-realism. Either way, the results might be quite spectacular and a lot of fun! And it might be just the right place for a computer scientist turned architect to be working.